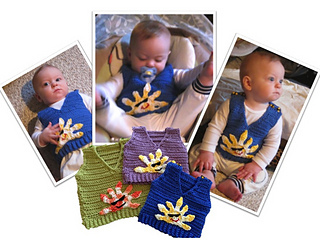 A sunny vest to brighten your little one’s day! This is a quick vest to stitch up in many colors. The stitches form a nice “striped” texture and there are buttons at the shoulders for easy on/off. The sun is a simple applique that is stitched on and can be centered or slightly off center for a different look. The cool sunglasses are made from felt, but can easily be embroidered too to avoid any “loose” parts. Available in sizes from newborn to 12 months. My patterns are written in Standard American Terms and include pictures, charts, stitch guides and explanations to make them easy to follow. Text and images (c)2012 The Pattern Paradise.